Aquinas College is a Catholic regional co-educational school whose mission is to provide a comprehensive education to Catholic students in the eastern suburbs of Melbourne. This education takes place in the context of Jesus’ Gospel message of love, justice and reconciliation. At Aquinas we believe all students can learn. Each of us is called by God to share our special and unique gifts with our world. Aquinas College seeks to develop these gifts by emphasising excellence in all areas of performance. We promote in our students an awareness of God in their lives, the value of human relationships, a sense of justice, a hopeful spirit and a love of learning. The Principal of Aquinas College is Mr Tony O'Byrne. Green A4 card folded to A5 size, printed both sides. Hand signed by attendees. 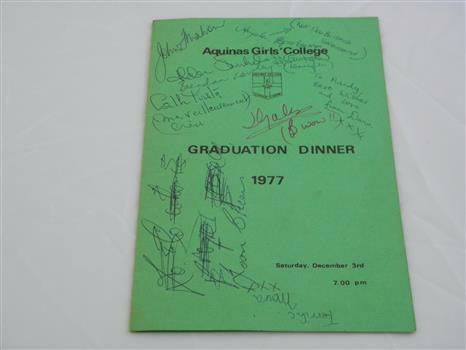 Signed on the night of the Graduation Dinner of Aquinas Girls College 1977. One signature reads "To Mandy" so this may have been originally intended for one person. Signature of John Mahon, former Principal of Aquinas College on front cover. Signatures make this item unique. Aquinas logo on front cover. Signatures of attendees on front and back cover, including signature of John Mahon former principal of Aquinas College. 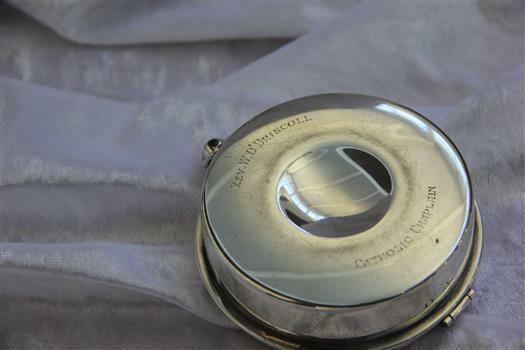 Round, silver container with attched lid. Interior is gold in colour. Donated to Aquinas College Archives by the Chapel in May 2013. Previously located in a cupboard in the Aquinas chapel. Insribed with a name of Father O'Driscoll, one of the founders of Aquinas College in 1961.